These are common warnings for many smartphone users around the world. To build products that work for billions of users, developers must address key challenges: limited or intermittent connectivity, device compatibility, varying screen sizes, high data costs, short-lived batteries. We first presented developers.google.com/billions and related Android and Web resources at Google I/O last month, and today you can watch the video presentations about Android or the Web. 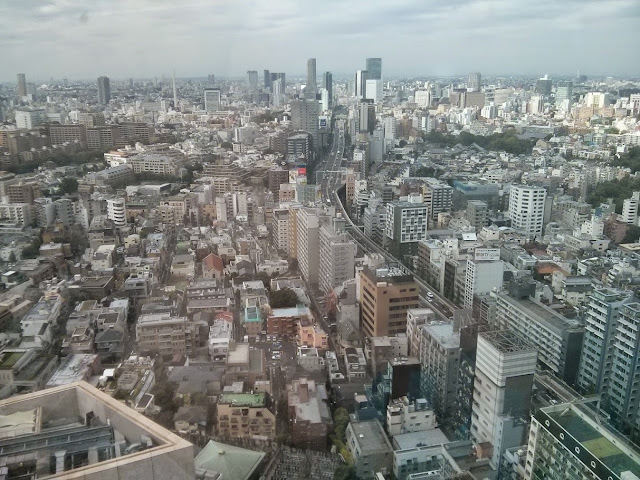 Your users move from place to place, from speedy wireless to patchy or expensive data. Manage these transitions by storing data, queueing requests, optimizing image handling, and performing core functions entirely offline. Keep context in mind - how and where do your users consume your content? Selecting text and media that works well across different viewport sizes, keeping text short (for scrolling on the go), providing a simple UI that doesn’t distract from content, and removing redundant content can all increase perception of your app’s quality while giving real performance gains like reduced data transfer. Once these practices are in place, localization options can grow audience reach and increase engagement. Low cost phones usually have shorter battery life. Users are sensitive to battery consumption levels and excessive consumption can lead to a high uninstall rate or avoidance of your site. Benchmark your battery usage against sessions on other pages or apps, or using tools such as Battery Historian, and avoid long-running processes which drain batteries. Whatever you’re building, conserve data usage in three simple steps: understand loading requirements, reduce the amount of data required for interaction, and streamline navigation so users get what they want quickly. Conserving data on behalf of your users (and with native apps, offering configurable network usage) helps retain data-sensitive users -- especially those on prepaid plans or contracts with limited data -- as even “unlimited” plans can become expensive when roaming or if unexpected fees are applied. Have another insight, or a success launching in low-connectivity conditions or on low-cost devices? Let us know on our G+ post. This entry was posted in Android Developers Blog and tagged Android, Android Developer, Featured on June 30, 2016 by Reto Meier. It’s been two years since we first shared our workforce demographics and helped spark a conversation about the need to improve diversity at Google and across the tech industry. Today we’re updating google.com/diversity with our 2015 demographics, and sharing some areas where we’ve seen progress in building a more diverse and inclusive Google. 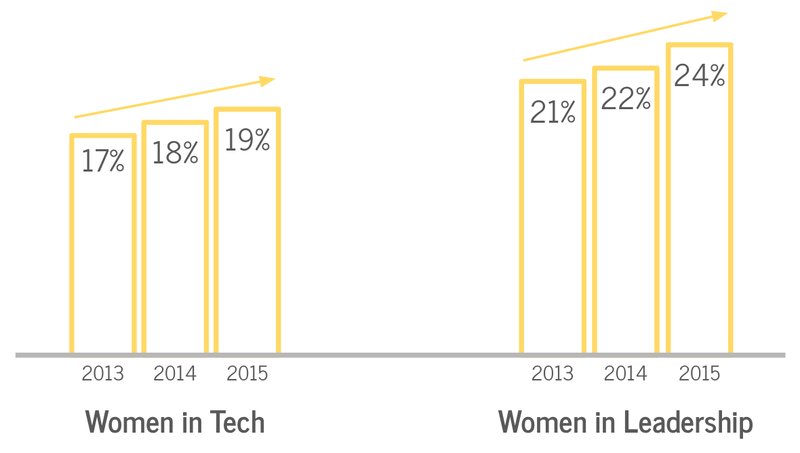 Women now comprise 31 percent of all Googlers, and we’ve seen strong growth of women in technical and leadership roles. Similar to last year, one in five of our technical hires in 2015 were women, helping bring the total number of women in technical roles from 18 to 19 percent. Additionally, women now hold 24 percent of leadership roles across Google—up from 22 percent. For the first time this year, we’re sharing the percentage of our hires who are Black and Hispanic. In 2015, our hiring for Black, Hispanic, and female Googlers grew faster than our current demographic representation for each of these groups. And our Hispanic Googlers in technical roles increased from 2 to 3 percent. This data reflects the gender composition of Google’s global technical workforce and the race & ethnicity composition of Google’s U.S. workforce as of January 1, 2016. For more stats, visit google.com/diversity. Hiring is important, but it’s equally important to make workplaces inclusive, fair and supportive for all employees. We’re continuing to build a culture where Googlers can grow, thrive and want to stay. We want to build a place where everyone feels comfortable sharing ideas and opinions—and empowered to grow their careers. We check and recheck processes like promotion and performance reviews to make sure they’re producing equitable outcomes, and address any gaps we find. For example, Googlers in engineering or product management roles are able to nominate themselves for promotion, and in 2010 we discovered that women in technical roles were less likely than men to self-nominate. We found that with a small nudge—emailing these findings to all technical Googlers—the rate of women self-nominating went up and now the gap between men and women has closed. Compensation is another example. We’ve long had gender pay equity in our workforce, and we recently shared our approach to compensation with the hope that other companies will adopt similar fair pay practices. We also continue to invest in our unconscious bias trainings. Over 65 percent of Googlers have participated in our unbiasing workshops, and all new Googlers take the workshop as part of their orientation. We’ve shared these materials and research on our platform re:Work with Google so anyone from any industry can create unbiasing trainings for their team. This entry was posted in Official Google Blog on June 30, 2016 by Google Blogs. The Google Feed API was one of Google’s original AJAX APIs, first announced in 2007. It had a good run. However, interest and use of the API has waned over time, and it is running on API infrastructure that is now two generations old at Google. Along with many of our other free APIs, in April 2012, we announced that we would be deprecating it in three years time. As of April 2015, the deprecation period has elapsed. While we have continued to operate the API in the interim, it is now time to announce the turndown. As a final courtesy to developers, we plan to operate the API until September 29, 2016, when Google Feed API will cease operation. Please ensure that your application is no longer using this API by then. Google appreciates how important APIs and developer trust are and we do not take decisions like this one lightly. We remain committed to providing great services and being open and communicative about their statuses. For those developers who find RSS an essential part of their workflow, there are commercial alternatives that may well fit your use case very well. This entry was posted in Google Developers Blog and tagged cloud on June 30, 2016 by Google Devs. This entry was posted in Google Developers Blog and tagged Chrome on June 30, 2016 by Google Devs. Editor's note: Teachers are uniquely inspiring people. It takes a teacher to engage students, bring the classroom alive and turn classroom concepts into lifelong passions. This week at ISTE, we announced four new ways for these everyday heroes to engage their classes using Google tools. One of these announcements was that Expeditions — virtual reality field trips using Cardboard — is now available to everyone. To get started, all teachers need to do is download the Expeditions app onto a set of devices and choose where in the world they want to take their class. The app is available today for Android and will be available for iPhones and iPads soon. Many students at CCSD 62 come from low-income families and may have never traveled outside of their community. But with Expeditions, teachers can take these students on trips of a lifetime and make lesson plans more interactive and meaningful. Teachers at CCSD 62 can apply to use the district’s “traveling suitcase” with all the tools and technology to take students on an Expedition. Read how Sarah, Elizabeth and Matt are encouraging students to become curious learners and establish deeper connections with their surroundings. Since Sarah got an Expeditions kit for her classroom, her students have developed a new love of learning about science. In the past it was difficult for students to visualize the concepts they learned, such as how big a geographical landmark is. Now that Expeditions is an integral part of every unit, or themed area of focus, students have been more engaged and are asking more in-depth questions that show a deeper understanding of the topics. For example, Sarah first took her students to the Grand Canyon to show them the processes that formed one of the seven wonders of the world when they were studying Earth History. 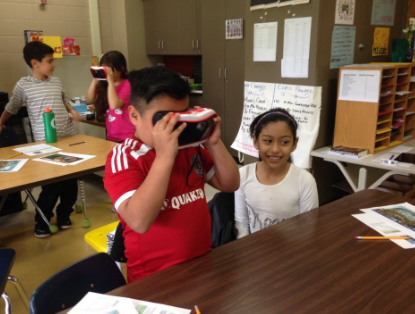 When they put on Google Cardboard, students started becoming curious about new aspects of the landmark and asked questions like “How did it form?” and “What do the stripes mean?”. Sarah also encourages students to discover their passion for learning and science by letting them lead Expeditions. When students lead instead of the teacher, they ask each other different types of questions, sparking meaningful conversations. They’re also sharing their knowledge after exploring diverse ecosystems in small groups. For example, a group of students studying the desert shared what they learned during Expeditions with students focusing on the rainforest, and vice versa. This personalized learning and peer-to-peer sharing encourages students to be active learners and take ownership of their education. In her art classes, Elizabeth often shows students photos of art, sculptures and monuments to inspire their own creations, but when she had the opportunity to use Google Expeditions, she knew she could provide them with a “larger than life” source of inspiration. Elizabeth chose the Colosseum Expedition, which fit nicely into the current unit about monuments. Since Elizabeth doesn’t have an Expeditions kit permanently in her classroom like Sarah, she’s found creative ways to recreate the virtual reality experience using Google Street View and YouTube 360 videos. With Elizabeth’s DIY virtual reality, students experienced driving across the Golden Gate Bridge in an Indie 500 car. Others went to the top of the Space Needle and said it felt like they were free birds soaring above the world. After these experiences, which many students couldn’t imagine doing in real life, students added more detail to their drawings, analyzed their work more and made deeper connections when thinking about how objects relate to the world. By using virtual reality-like experiences, Elizabeth is giving students a new source of inspiration for their art and more insights and tools to express their thoughts and reflections. Math concepts can be abstract, and while students may see its application to calculating a tip at a restaurant or measuring ingredients in the kitchen, they might not always see the more fun uses. 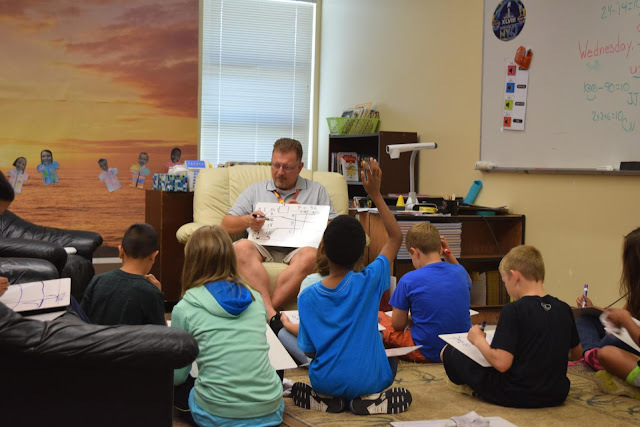 Matt uses Expeditions to explore landmarks and show fourth grade students how math concepts, specifically geometry, can be useful beyond the classrooms. When his students embarked on the Great Wall of China Expedition, he taught them how right angles contribute to the stability and construction of structures. After that visit, the entire unit was more impactful because students connected the math concepts to their Expeditions experience. 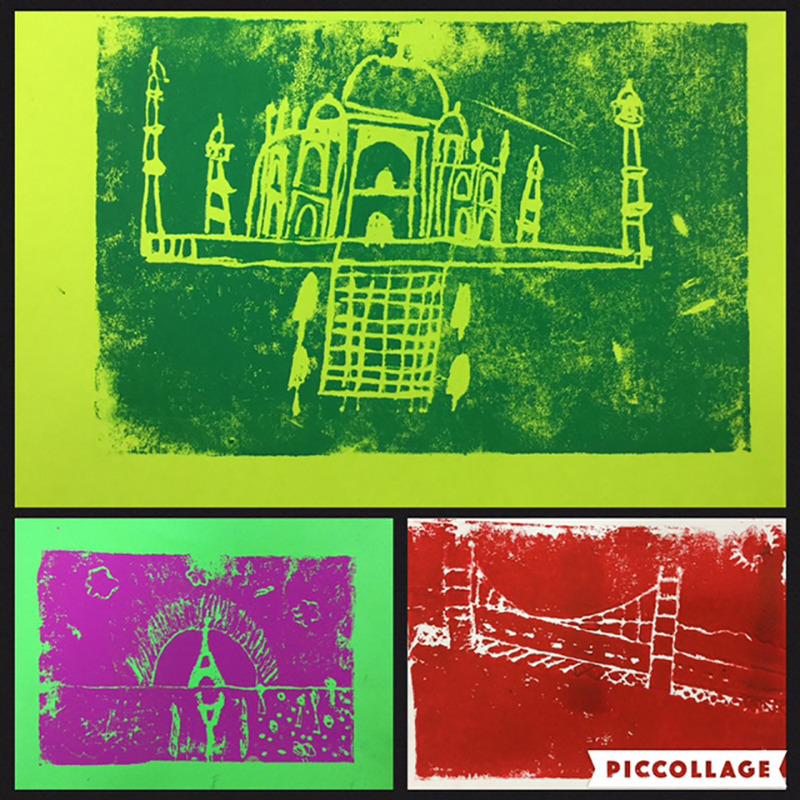 When they saw how math can help a monumental structure last so long, students began to wonder about the architectural design and math concepts behind other buildings and monuments. Just as Elizabeth does, Matt takes his students on additional virtual reality trips by using Google Street View. His students “walked around” 16th Street Baptist Church and talked about the location’s significance and its role in U.S. history. Sarah, Elizabeth and Matt are creating field trip-like experiences for their students to inspire them to think more creatively, “travel” around the world and find greater meaning for classroom lessons as they pertain to real life. Earlier this week, we announced that Expeditions is available to everyone. To get started, all teachers need to do is download the Expeditions app onto a set of devices and choose where in the world they want to take their class. The app is available today for Android and will be available for iPhones and iPads soon. 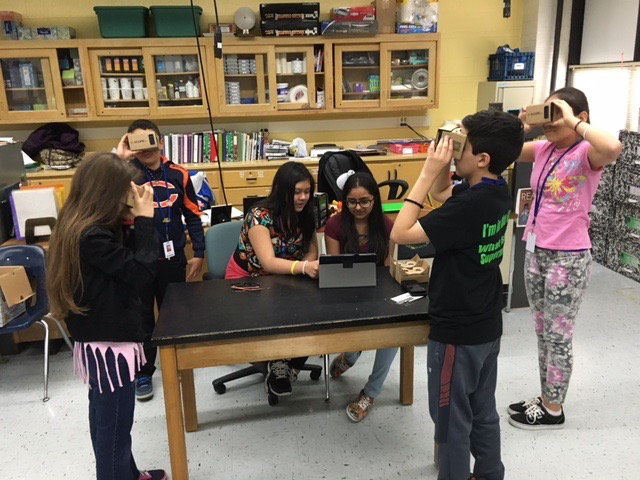 This entry was posted in Google for Work Blog and tagged Google Expeditions on June 30, 2016 by Jane Smith. At Google I/O 2016, we launched a significant new release of Firebase that consolidates several of Google’s mobile offerings into a single product. The new Firebase reduces the complexity of building mobile client and backend services and provides tools to help you grow your user base, earn revenue from your app and collect and analyze app-event data. With Firebase, you can easily build a scalable and loosely coupled system. For example, you can add iOS or web clients without any impact to existing Android clients. If you need backend services, App Engine Flexible Environment can add new backend capacity automatically. We recently published a new solution document that demonstrates how to build a native chat application with a step-by-step guide and sample code for both an Android app and an App Engine-based backend service. The solution, “Build a mobile app using Firebase and App Engine flexible environment,” shows how to handle interactions between the Android app and servlets running in App Engine Flexible Environment. 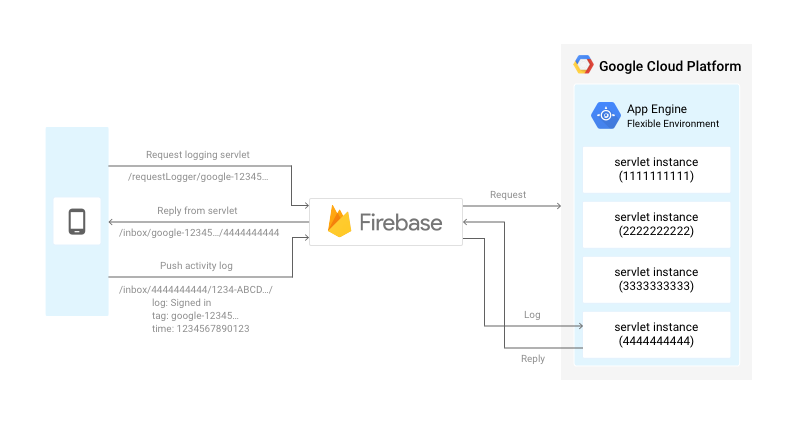 By storing data in the Firebase Realtime Database, the Android client app exchanges chat messages with other users and also pushes user-activity logs, such as sign-in and sign-out events and channel-change events, to Java Servlet instances in real-time. Heavy and asynchronous backend processing — Tasks that are too resource-intensive to run on client devices can be processed asynchronously by a backend service. Real-time fraud detection — Servlets can detect user events from multiple devices in a short period of time. ETL processing — A backend service can pass user-event logs to other data stores such as Google BigQuery, for advanced analysis. For more information, see the Firebase documentation, or learn about how to build mobile solutions using various Google Cloud Platform products. If you're interested in Firebase and App Engine, you can also sign up for a free trial. This entry was posted in Google Cloud Platform Blog and tagged Google Cloud Platform on June 30, 2016 by GCP Team. The beta channel has been updated to 52.0.2743.60 for Windows, Mac, and Linux. This entry was posted in Google Chrome Releases and tagged Beta updates, Google Chrome on June 30, 2016 by Di Mu. Editor's note:Teachers are uniquely inspiring people. It takes a teacher to engage students, bring the classroom alive and turn classroom concepts into lifelong passions. This week at ISTE, we announced four new ways for these everyday heroes to engage their classes using Google tools. One of these announcements was that Expeditions — virtual reality field trips using Cardboard — is now available to everyone. To get started, all teachers need to do is download the Expeditions app onto a set of devices and choose where in the world they want to take their class. The app is available today for Android and will be available for iPhones and iPads soon. Expedition Sarah also encourages students to discover their passion for learning and science by letting them lead Expeditions. When students lead instead of the teacher, they ask each other different types of questions, sparking meaningful conversations. They’re also sharing their knowledge after exploring diverse ecosystems in small groups. For example, a group of students studying the desert shared what they learned during Expeditions with students focusing on the rainforest, and vice versa. This personalized learning and peer-to-peer sharing encourages students to be active learners and take ownership of their education. This entry was posted in Google for Education Blog and tagged Education on June 30, 2016 by Alex Lockwood. This entry was posted in Google for Education Blog and tagged Education, Google Expeditions on June 30, 2016 by Googlefor Edu. Editor's note: This week we announced four new ways to help teachers engage their classes using Google educational tools. This post dives deeper into one of the those announcements: Cast for Education. In his 11 years of teaching at Hillcrest Elementary in the Lake Stevens School district in Washington State, Bob Coleman has witnessed how educational technology can help advance collaboration and engagement in the classroom. So when the 4th grade teacher found his students stuck on a common math problem, he gathered the class in front of the classroom projector. Sitting behind his desk — now in front of his students and not among them — Mr. Coleman realized that the biggest screen in the room was only available to the teacher. In Mr. Coleman’s classroom — and for millions of students around the world — both education and technology are expected to be collaborative. But today, the classroom projector is most often out of reach for students. Educators are eager to overcome this barrier, so much so that wireless screen sharing for schools was one of the top features requested by teachers in 2015. Teachers, we heard you loud and clear. Yesterday we announced Google Cast for Education, a free Chrome app that allows students and teachers to share their screens wirelessly from anywhere in the classroom. 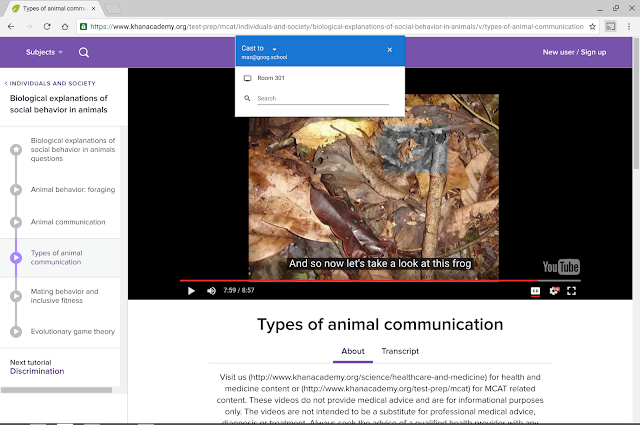 Cast for Education carries video and audio across complex school networks, has built-in controls for teachers, and works seamlessly with Google Classroom. And because the app runs on the teacher’s computer that’s connected to the projector, it doesn’t require new hardware. Teachers run the Cast for Education app, and students share their screens through the Cast feature in Chrome. *Note: Visit g.co/CastForEDU to try Cast for Education today in beta, with full availability for Back to School 2016. 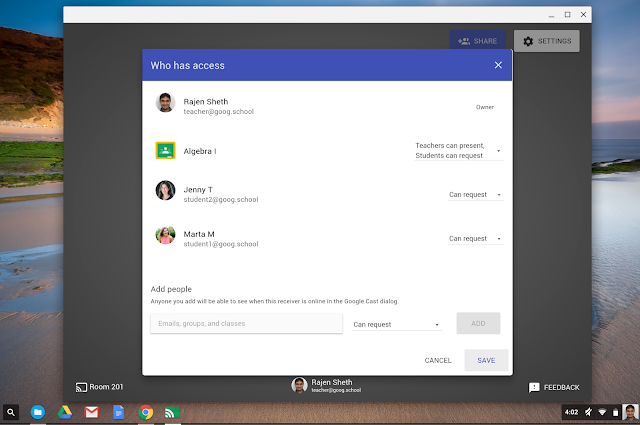 Chrome management admins can install the new Cast for Education app for all teachers, and the Google Cast extension for their entire domain. This entry was posted in Google for Work Blog and tagged Google for Education on June 30, 2016 by Jane Smith.